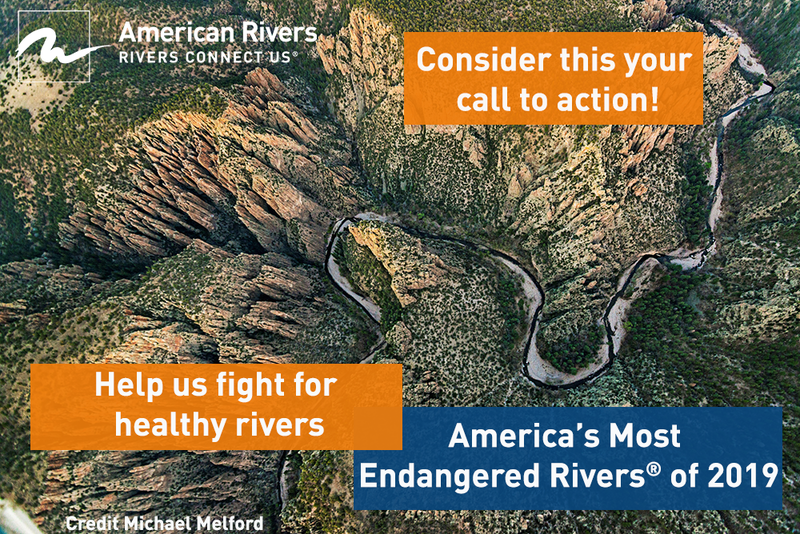 American Rivers is a 501(c)(3) non-profit organization. Contributions are tax deductible to the extent allowed by law. Financial information about American Rivers can be obtained by contacting us at 1101 14th Street, NW, Suite 1400, Washington, DC 20005, 877-347-7550, or as stated below. Colorado: Colorado residents may obtain copies of registration and financial documents from the office of the Secretary of State, (303) 894-2680, http://www.sos.state.co.us/ re: Reg. No.20023003567. Registration by the secretary of state is not an endorsement of either the paid solicitor or the organization or cause the solicitor represents. Florida: REG NO. SC No. CH-938. A COPY OF THE OFFICIAL REGISTRATION AND FINANCIAL INFORMATION MAY BE OBTAINED FROM THE DIVISION OF CONSUMER SERVICES BY CALLING TOLL-FREE, WITHIN THE STATE, 1-800-HELP-FLA., OR VIA THE INTERNET AT WWW.800HELPFLA.COM . REGISTRATION DOES NOT IMPLY ENDORSEMENT, APPROVAL, OR RECOMMENDATION BY THE STATE. Georgia: A full and fair description of the programs and activities of American Rivers and its financial statement are available upon request at the address indicated above. Illinois: Contracts and reports regarding American Rivers are on file with the Illinois Attorney General. Kansas: The annual financial report for American Rivers, Kansas Registration no. 201-905-7 for the preceding year is on file with the Secretary of State. Maryland: A full and fair description of the programs and activities of American Rivers and its financial statement are available upon request at the address indicated above. For the cost of postage and copying, documents and information filed under the Maryland charitable organizations laws can be obtained from the Secretary of State, Charitable Division, State House, Annapolis, MD 21401, (800) 825-4510. 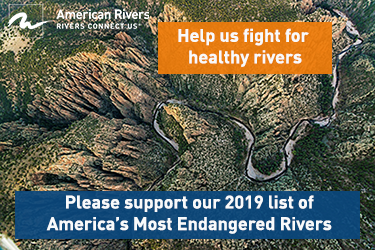 Mississippi: The official registration and financial information of American Rivers may be obtained from the Mississippi Secretary of State’s office by calling 1-888-236-6167. Registration by the Secretary of State does not imply endorsement by the Secretary of State. North Carolina: Financial information about this organization and a copy of its license are available from the State Solicitation Licensing Branch at 1-888-830-4989 (within North Carolina) or (919) 814-5400 (outside of North Carolina). The license is not an endorsement by the State. Pennsylvania: The official registration and financial information of American Rivers may be obtained from the Pennsylvania Department of State by calling toll-free, within Pennsylvania, 1-800-732-0999. Registration does not imply endorsement. Virginia: Financial statements are available from the State Division of Consumer Protection, Department of Agricultural and Consumer Services, P.O. Box 1163, Richmond, VA 23218. Washington: The notice of solicitation required by the State Office of Consumer Affairs is on file with the Washington Secretary of State, and information relating to financial affairs of American Rivers is available from the Secretary of State, and the toll-free number for Washington residents: 1-800-332-4483. REGISTRATION IN THE ABOVE STATES DOES NOT IMPLY ENDORSEMENT, APPROVAL OR RECOMMENDATION OF AMERICAN RIVERS BY THE STATE.